The Viscardi Center launched the first in a series of videos aimed at educating lawmakers on the detrimental effects cuts to Medicaid may have on people with disabilities. The video, “Meet Dylan. Then, Say NO to Medicaid Cuts,” urges lawmakers to refrain from making cuts by visually showing the affect the cuts may have and how the equipment and supports Medicaid provides assist people with disabilities in their daily lives. A student from the Henry Viscardi School at The Viscardi Center has been recognized with a national 2017 Yes I Can Award Nomination by the Council for Exceptional Children (CEC) as part of its annual convention on April 21 in Boston. Samuel Tavarez was nominated by occupational therapist Jennifer Noronha, PhD, OTR/L, for his outstanding achievement in school and within the community. The 35th Annual Reach for a Star Luncheon, presented by Americana Manhasset, is sure to be a WICKED good time. Jennifer DiNoia, who plays Elphaba in Broadway’s smash hit WICKED, will perform a song set at the milestone fundraiser on April 4 at the Crest Hollow Country Club. The Reach for a Star Luncheon benefits extracurricular and after-school programs for children with severe physical disabilities from the Henry Viscardi School at The Viscardi Center. 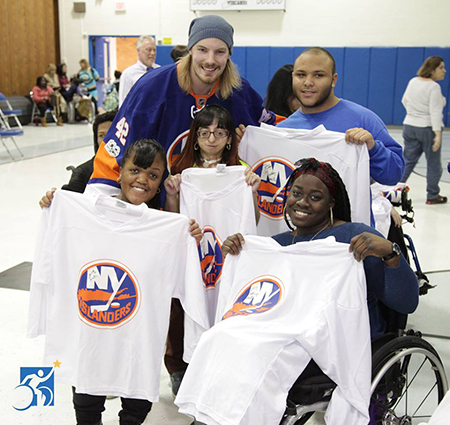 Four members of the New York Islanders teamed up with the Henry Viscardi School at the Viscardi Center to demonstrate that Hockey is for Everyone on Wednesday, February 1. 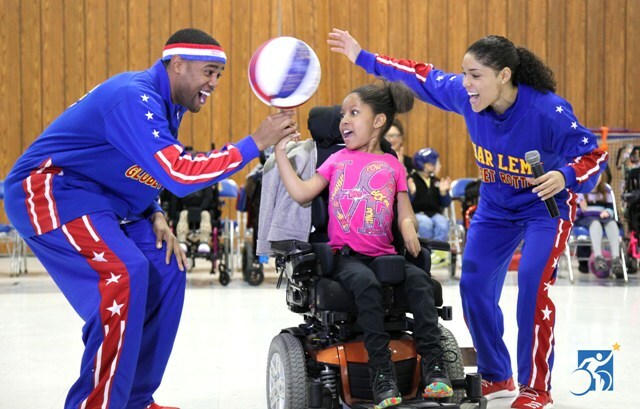 On December 22, 2016, the Harlem Globetrotters visited the Henry Viscardi School at The Viscardi Center to entertain students with their famous b-ball skills and tackle important issues about bullying. 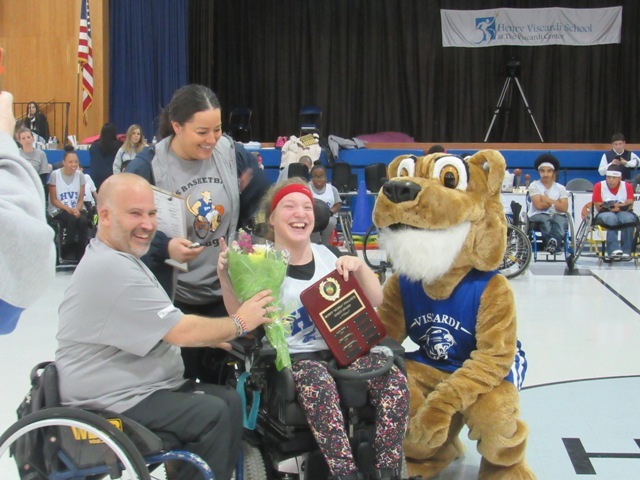 The Henry Viscardi School (HVS) at The Viscardi Center’s Wheelchair Basketball Program hosted its 25th annual Sportsmanship Tournament on December 3, 2016. Several games led up to the final championship round of the day, with the Viscardi Varsity Cougars playing against the competitive Westchester School for Special Children team. The Varsity Cougars claimed victory on their home turf, winning over Westchester 24-14 to receive the first-place trophy. December 1, 2016 – Albertson, NY – The Viscardi Center, a network of non-profit organizations providing a lifespan of services that educate, employ, and empower people with disabilities, today announced the ten recipients of the 2016 Henry Viscardi Achievement Awards at a special reception in New York City. Albertson, NY – November 16, 2016 – Philip L. Blum, Vice President and Senior Counsel at CA Technologies, was appointed to the Henry Viscardi School at The Viscardi Center Board of Trustees. Henry Viscardi School educates children with severe physical disabilities who often require life-sustaining medical treatment throughout the day and may otherwise need to receive instruction in their homes or a hospital setting. Read the fourth issue of our newsletter, Viscardi Voice.